Jerusalem is like a huge pile of Lego bricks that have been used by generations of children. Some bits remain stuck together; some have been chewed up by the family dog; and some have been reused in ways they were never originally intended. Walking around Jerusalem has you completely surrounded by history at every turn. The place just breathes history. Unfortunately for the sightseer much of that history involved knocking the place down and building something else over the top – often reusing the same stones. Some of the new creations like the Dome of the Rock are quite beautiful; others require more imagination to come to terms with if they do not freight in emotions from your religious background. That may be a key issue for us in looking at Jerusalem: we’re not importing any emotion, the sort of emotion that gives a pile of stones deep meaning. I can understand the emotion the Wailing Wall has for the Jewish people. In fact, I’m in awe of the idea that for 2000 years of diaspora they would toast each other with the idea of ‘next year in Jerusalem’ only to have it finally come to pass. But it’s not my emotion. Any more than I feel an intrinsic connection with the Dome of the Rock or the Church of the Sepulchre. 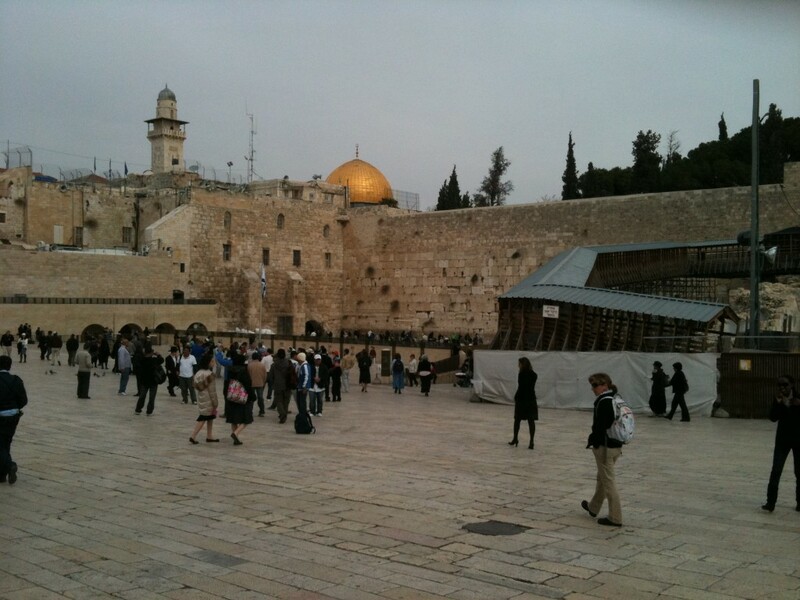 And without the emotion, the Wailing Wall is not exactly awe-inspiring. In an effort to try to gain some sort of overview on this city, we visited the Time Elevator today. This is like a roller-coaster that doesn’t move – banks of seats are connected to hydraulic rams which push them about synchronised with what is happening on huge screens in front of you. In fact a flight simulator like they use to train pilots is probably a better analogy. It comes with additional features like splashes of water at appropriate points. So in the course of half an hour we were hurled through the history of Jerusalem. We watched the flames of the Temples burning; saw Helena finding the point of Jesus’ crucifixion; and watched Mohammed ride through the night to ascend to heaven. Probably the most immediate part of the show, though, was footage of Israeli paratroopers advancing into the Old City in 1967 – as they advanced through the Jaffa Gate we all exclaimed that we’d stood on that spot just yesterday. The experience definitely helped the kids put the high points of Jerusalem’s history into some sort of perspective. We’re enjoying Jerusalem for its walkability, for its history and for its beauty. But like a really big Lego set we’re finding it involves a lot of parental involvement for it to work for the kids. Previous Israel, does my bum look big with this gun?